We must start our thank you’s with our inspirational leader, Susie Buzby. She has the power to make us smile or bring us to tears at any moment and that’s a testament to her incredible heart. We want to thank her husband Brent and daughters Kaitlyn, Amelia and Autumn as well as Susie’s extended family who donated auction items, volunteered and attended Shamrocks. We cannot thank the Breeze’s team including owner Win Allen and his incredible staff for their selfless efforts throughout the planning process and day of event festivities. The venue, food and staff were amazing! Please visit them this spring & summer – you won’t be disappointed! We raised net proceeds of $8,371.67 at our inaugural Shamrocks for Hope on Saturday March 11th and by Monday March 13th at 6pm ALL those funds were distributed to local families affected by a cancer diagnosis. Thank You! Our 100% volunteer Board of Directors were well represented by: Dani Corso, Kristin Panzone, Steve Crisalli and Bill Raney. Susie Buzby, Dawn Aversa, Lizzie Martinez and Jennifer Hornik from our Directors of Patient Advocacy were all present for Shamrocks. The fantastic duo of Melanie and Tony donated their time and talents to the event and we are grateful to them for their giving spirit. Leah Morgan donated her face-painting skills to the event where kids and adults took advantage of her amazing talents. Our friends Rob and Janet Conforti from Party Crashers Gaming Trailer donated their gaming trailer to the event to ensure our kids were occupied throughout the day. Thank you. Ayme Friggle from Unique Embroidery & Designs donated her talents by creating 100 Shamrock party hats and a couple of auction items. We want to thank our Auction Donors who generously donated crafts, experiences, gift cards and merchandise to our auction. A special thank you to Viking Yachting Center and staff for their support for this event. Our incredible supporters old and new who came out in force for this inaugural event. Thank you so much! 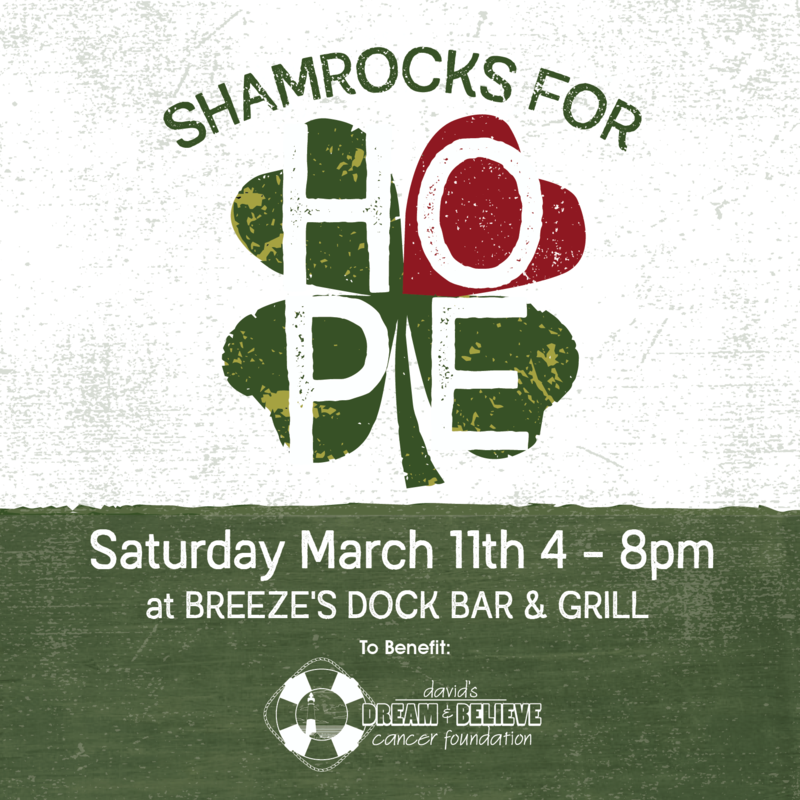 See you Saturday March 10, 2018 for our 2nd Annual Shamrocks for Hope! DDBCF provided direct financial assistance to 244 families, while countless more received emotional support, services and hope. A record-breaking $215,457.97 in ​Direct ​Financial Grants​ were distributed. DDBCF established a new Directors of Patient Advocacy Board, consisting of: patients, caregivers and medical personnel. The incredibly generous team from Equity ​Prime Mortgage’s ​planned giving initiative set an all-time DDBCF record for Giving with an astounding $24,375.00 donated in the year 2016! DDBCF welcomed 2 returning members back to the Board of Directors; Co-Founder Carmen Malatino and Kelly Powers; while three new Board Members Jason Cosimano, Steve Crisalli and former Director of Patient Advocacy Bill Raney were invited to serve as well. ​Office space for the Foundation was secured at 364 North Main Street, Suite 10D in Manahawkin, NJ. ​Director of Patient Advocacy; Lauren M. Raney (7/28/1977-12/16/2016) was appointed by the Board of Directors as our Inaugural Trustee Emeritus. 2011 – 2016: 763 Families battling a cancer diagnosis have received $621,813.06 in Financial Grants! All of us at David’s Dream & Believe Cancer Foundation want to thank our patients and their families for inspiring us each and every day. It was an extremely difficult end to 2016 with the passing of so many loved ones and friends of DDBCF including: Mallory, Anthony, Virginia, Melissa, Michael, Phyllis, Layard, Alice, Patricia and Lauren. Our thoughts, prayers and love remain with all of these families. In the midst of her own battle with cancer, Lauren Raney proudly served as an original member of our Directors of Patient Advocacy Board in hopes that she could offer support to other patients battling this deadly disease. 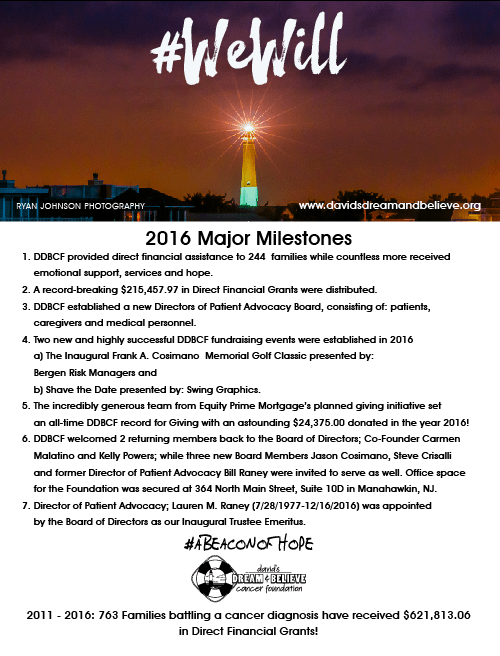 What Lauren may not have realized before her passing on December 16th is that she not only offered our current patients support and hope but lifted the spirits of any and every person that was blessed to have crossed paths with her.. On December 20th 2016, the DDBCF Board of Directors unanimously voted to appoint Lauren M. Raney as our first ever Trustee Emeritus. Lauren will be forever honored for her service as a Director of Patient Advocacy while all of us trust that she will eternally watch over and guide us on this journey. Thank you to our Executive Partners at Equity Prime Mortgage. Equity’s planned giving initiative has set a high standard for charitable giving thanks to the efforts of Stephen, Christopher, Michael, Equity Staff and all their customers. Thank you to our community partners, sponsors, auction donors and volunteers! Thank you to students from our Southern Regional High School group led by teachers Ms. Rebecca Posch and Mrs Jody McLennan. Thank you to our community partners, Dawn and Pete from Swing Graphics and Ryan Johnson from Ryan Johnson Photography for their help with photo, images and multiple revisions to content. A special thank you to our Board of Directors (Steve Crisalli, Dani Corso, Kristin Panzone, Bill Raney, Kelly Powers, Jason Cosimano, Tim Hall & Carmen Malatino) who serve the mission of the Foundation on a 100% volunteer basis! We want to thank our friends Dan & Lori Malay at How You Brewin? 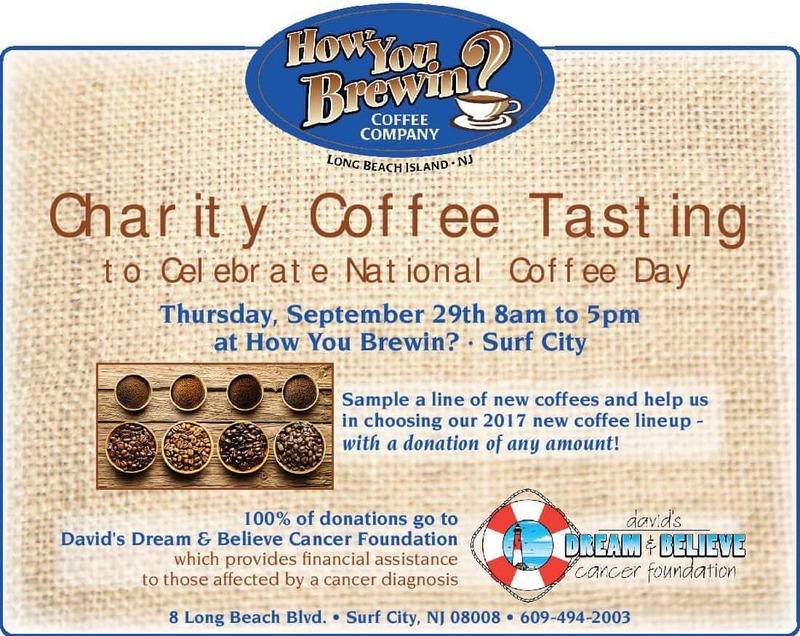 in Surf City, NJ for turning National Coffee Day on Thursday September 29th into a fundraising opportunity for the families of David’s Dream & Believe Cancer Foundation battling a cancer diagnosis. It’s creative partnerships with business owners like Dan and Lori that affords us the opportunity to offer financial assistance, services and hope to over 650 families in 5.5 years. We also want to thank Director of Patient Advocacy Susie Buzby for her help and support on this event. Board of Directors Danielle Corso and Steve Crisalli will also be in attendance. Please stop by How You Brewin? 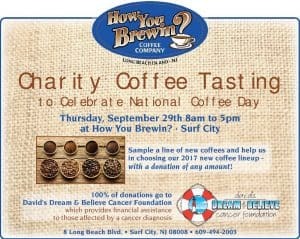 in Surf City, NJ on Thursday September 29th between 8am-5pm. Sample a line of new coffees by making a donation of any amount to David’s Dream & Believe Cancer Foundation and help How You Brewin? choose their 2017 coffee lineup. 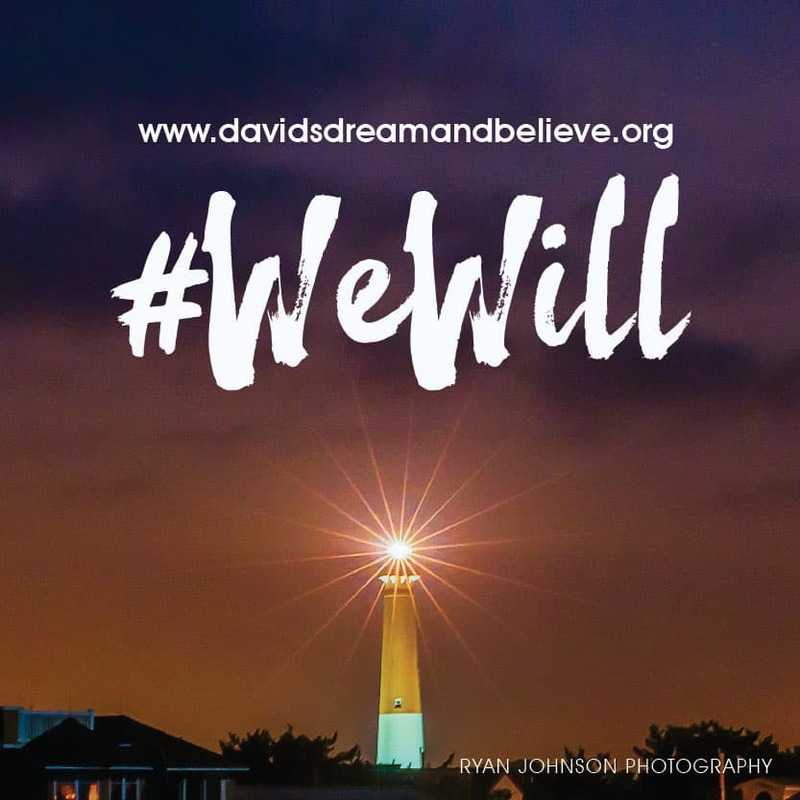 David’s Dream & Believe Cancer Foundation will be present throughout the day with giveaways, DDBCF t-shirts and sweatshirts for sale and our Mega 50/50 raffle tickets. Our Mega 50/50 drawing will take place on Thanksgiving Day with 1st Prize receiving up to $15,000.00 and 2nd Prize receiving up to $10,000.00 with only 1,000 tickets being sold at $50.00 per ticket.